An App on your mobile device can make your house hunt much easier. But you need an App that gives you access to all the Listings, not just one Broker's listings. And you need an App that is up to date so you're not wasting your time on old listings. The best App is one that gives you direct access to the local MLS (Multiple Listing Service) so you can search like a Realtor. Orange County MLS Homes is a new 5 Star Rated App that stands out because it gives you real-time access to the MLS. It also has real-time location GPS so you see all the listings around you everywhere you go. Just drive through a neighborhood and have instant access to all the homes for sale, recent sales, and Open Houses. You can view photos and listing details, save favorites, and share listings with others involved in your home search. 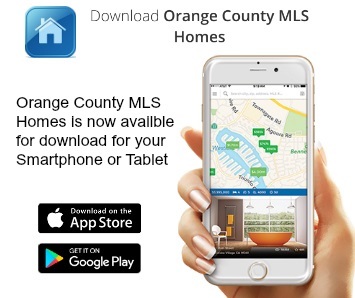 You can download Orange County MLS Homes on your Smart Phone or Tablet from the App Store for iPhone or Google Play for Android.